Our media skills training courses will prepare you for live and recorded interviews, television appearances, press conferences, web casting and radio interviews. 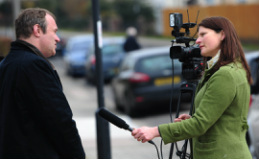 We offer one-to-one or group media skills training with professional working journalists and camera crews. You'll be put through your paces in front of the camera or down the line as you learn professional techniques, how to get your message across and how to handle those tricky questions. Training is done in the most realistic situations possible out in the field or in a 'studio' set. All of our sessions are filmed and each client receives a personal debrief based on their performances on the day. Our media skills trainers didn't work in journalism 10 years ago - they are all working professionals who regularly write, film and present regional and national news programmes. They will help you to understand what media skills are relevant now, secure your organisation more air-time, how journalists work and how you can come across on television, radio, press and web stories more professionally.